As we enter the 2018 Holiday season, all market watcher and observer eyes will be on this year’s shopping trends. 2017 saw an astonishing 583.9 billion spent on brick and mortar store shopping and an impressive 108 billion dollars spent in online holiday shopping, according to the National Retail Federation. Although online shopping is a formidable market force for American holiday shopping; 2017, saw shoppers give physical store retailers their best holiday season since 2011 as USA today highlighted. In reading through this you may be asking yourselves how and why these levels of spending and consumer boldness are where they are, and really it stems from the current strength of the United States economy. After the American Recovery and Reinvestment act of 2009 that provided an economic relief and stimulus package following the great recession, unemployment has remained low with steady private and public sector job growth. With September and October of 2018 seeing the lowest level of unemployment (3.7%) in 50 years, consumer confidence is at the highest it has been since 2000 as evidenced by the US Bureau of labor statistics. With 2017 being such a lucrative year for all retailers, it will be very interesting to see what 2018 numbers and trends look like- especially with consumer confidence being through the roof presently. Don’t be surprised if 2018 is even more financially rewarding- this holiday season could very well be one for the record books. To conclude, we wanted to present how productive and popular both online and in person holiday shopping is, but also why people sometimes choose one over the other. Online shopping is used for convenience as it can be done to get gifts more privately and completed in a matter of minutes. 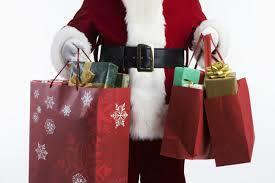 Shopping in person, particularly around the holidays, is mainly about the experience and atmosphere of it all. Millions of American’s still enjoy visiting their malls and favorite stores and being able to see, try on and take items home right away instead of waiting for them to ship. With the 2017 Holiday season all wrapped up, 2018 promises to be another year of sky-rocketing levels of holiday shopping. This entry was posted on Wednesday, December 5th, 2018 at 2:24 pm. Both comments and pings are currently closed.